The complaint alleges that Mohamad Yassin Alcharihi further violated federal law by concealing the mosaic at his residence. 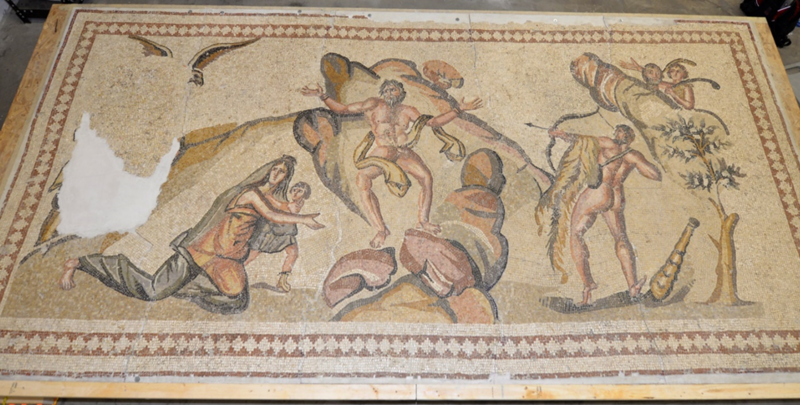 After the mosaic was seized, an expert retained by the government concluded that that the artwork “was an authentic mosaic from the Byzantine Period depicting Roman mythology, and was consistent with the iconography of mosaics found in Syria, in particular in and around the city of Idlib, Syria.” The complaint alleges that the mosaic was imported into the United States with paperwork indicating that it was part of a shipment of vases and mosaics worth only about $2,200, but Alcharihi later admitted paying $12,000 for the items. Preliminary estimated values for the mosaic at issue in this case are much higher, according to the complaint.. The United States has adopted import restrictions on archaeological and ethnological material from Syria, according to the complaint, which quotes a statement from U.S. Customs and Border Protection stating: “[f]or decades, the United States has shared the international concern for the need to protect endangered cultural property. The appearance in the United States of stolen or illegally exported artifacts from other countries where there has been pillage has, on occasion, strained our foreign and cultural relations. This situation, combined with the concerns of museum, archaeological, and scholarly communities, was recognized by the President and Congress.